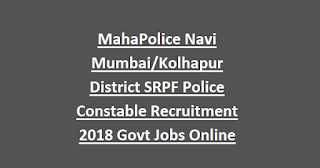 recruitment website of Maharashtra State www.mahapariksha.gov.in on or before 02-02-2019. Selection for these vacancies will held through Physical Efficiency tests, Physical Standard Test, Certification verification and medical tests. 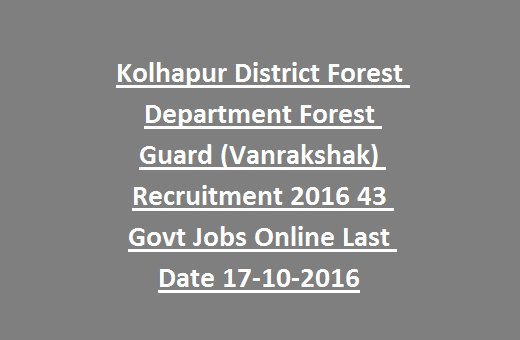 For more details regarding Kolhapur District Forest Guard Recruitment please see the details provided below. 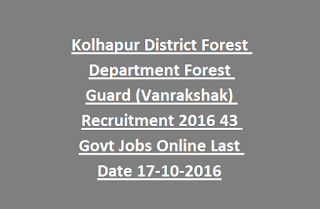 There are total 72 vacancies available in this current recruitment of Kolhapur Forest Department. Lower age limits is 18 years and upper age limit is 25 years. For reserved categories 5 years of age relaxation is given. HSC in Maths or Science or Commerce or Geography or its equivalent from a recognized board or institute. Rs.300 for General candidates and Rs.150/- for reserved candidates. Candidates have to pay this amount in State bank of India through payment chalan which is generated at the time of online submission of application form. 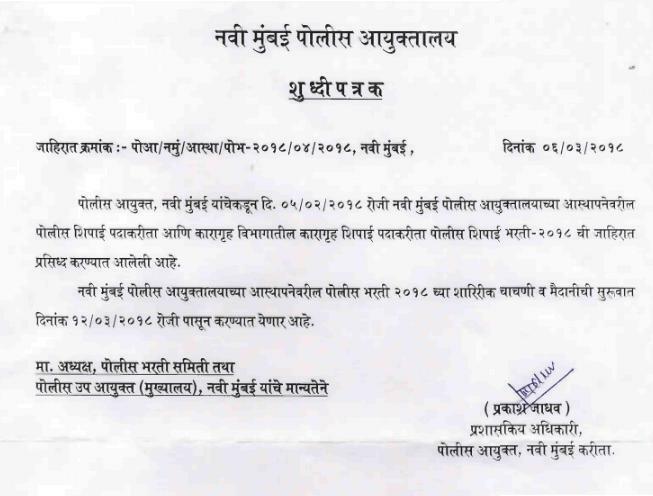 Selection this Kolhapur Forest Guard recruitment will be held based on Physical Efficiency Test and Physical standards test. Eligible candidates can submit their application forms online via the Maharashtra state recruitment website @maharecruitment.mahaonline.gov.in. Fill all the necessary details and upload the photo and signature images and submit the application form. Generate the fee payment chalan and pay the fee on or before 02-02-2019. SRPF विभाग उपलब्ध आहेत. आपण आवश्यक पात्रता अटी आणि पूर्ण बारावीच्या / 12 वर्ग पूर्ण असेल तर तुम्ही या नवी मुंबई / कोल्हापूर SRPF पोलिस शिपाई नोकरी अर्ज करण्यास पात्र आहेत. नवी मुंबई SRPF पोलिस शिपाई भारती अर्ज / कोल्हापूर विभाग ऑनलाइन फॉर्म केवळ येणार आहे. आपण अनुप्रयोग www.maharasthrasrpf.gov.in किंवा mahapolice.mahaonline.gov.in माध्यमातून सादर करू शकता. नवी मुंबई / कोल्हापूर विभाग च्या SRPF कॉन्स्टेबल रोजगार निवड प्रमाणपत्र पडताळणी आणि वैद्यकीय चाचण्या त्यानंतर शारीरिक कसोटी आधारित आहे. नवी मुंबई / कोल्हापूर SRPF पोलिस शिपाई भारती उपलब्ध पोस्ट, वय मर्यादा, पगार, शारीरिक चाचण्या आणि महत्वाचे तारखा इत्यादी तपशील खाली नमूद केलेल्या आहेत तपशील आहे. 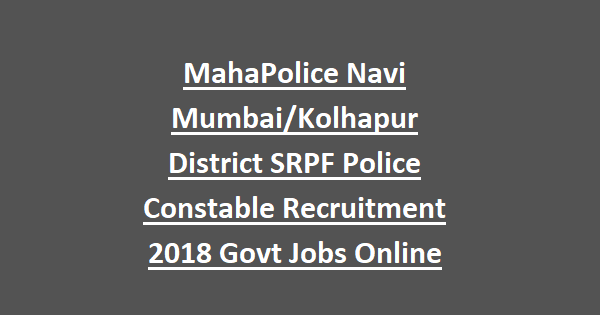 140 SRPF Constable vacancies in Navi Mumbai/Kolhapur Police Division of Maha Police. 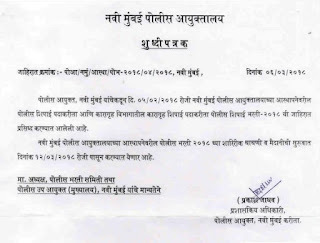 To apply for Navi Mumbai/Kolhapur SRPF constable Jobs candidate must have crossed 18 years and should not crossed the age of 28 years. For the candidates who are claiming the reservations for them 5 years of upper age relaxation is given. उच्च माध्यमिक शाळा प्रमाणपत्र नवी मुंबई / कॉन्स्टेबल कोल्हापूर SRPF पोलीस भारती अर्ज करणे आवश्यक आहे. साठी ऊर आणि रु .200 / - - माजी सैनिक साठी - राखीव आणि 50 / नवी मुंबई / कोल्हापूर SRPF पोलिस शिपाई रोजगार अर्ज शुल्क भरतीसाठी Rs.350 / आहे. लेखी परीक्षा, शारीरिक मोजमाप कसोटी, शारीरिक फिटनेस टेस्ट, मूळ प्रमाणपत्र तपास आणि वैद्यकीय चाचणी घेण्यात येणार आहे. पुरुष राखीव उमेदवार 2.5 सेमी विश्रांती उंची आणि चेस्ट दिले आहे. लेखी परीक्षा 100 गुण घेण्यात येणार आहे. लेखी परीक्षा वस्तुनिष्ठ एकाधिक निवड प्रश्न स्वरूपात असेल आणि कालावधी 90 मिनिटे आहे. ज्यांना वरील येत शारीरिक दर्जा आणि शैक्षणिक पात्रता, असे म्हटले आहे, वय मर्यादा ते www.maharashtrasrpf.gov.in किंवा mahapolice.mahaonline.gov.in वापरून वेबसाईटवर ऑनलाईन अर्ज करू शकता. 28-02-2018 पर्यंत ऑनलाईन अर्ज सादर करण्यासाठी अखेरची तारीख आहे.